My hubby has been hinting for several weeks that he wants cupcakes, but with only 3 of us in the house, I needed a good excuse for them or we'd eat them all ourselves - not good. So I was excited yesterday when my sister-in-law called and said that she and the kids would like to visit us. The cousins only live about half an hour away, but since they are six and (almost) nine and are in school, we don't get to see them as much as they or Abigail would like. This week is spring break, though, so a midafternoon visit isn't out of the question. While I usually bake most things from scratch using actual recipes, I have only ever made cupcakes from a mix (although I'm open to finding a good cupcake recipe). I'm not really particular about what mix I use - whatever is on sale is usually fine with me. I can't tell the difference between the brands. Yesterday I used a Pilsbury white cake mix (I keep a few on hand in case we want pistachio cake), but used whole eggs which made it mildly yellow (no butter in the mix for true yellow). The icing I did make from a recipe I found in the book Hershey's Best Loved Recipes. It's not my favorite chocolate icing, but it's easy and only requires one bowl (and no melting). Beat butter in medium bowl. Add powdered sugar and cocoa alternately with milk, beating to spreading consistency. Stir in vanilla. My note: the vanilla is very important. The chocolate gets a little bitter without it. I actually prefer other chocolate buttercream frostings, but like I said, this one is my easiest. I wish I had a photo of the cupcakes, or at least the aftermath of 3 kids eating the cupcakes (all of them are really more into frosting, and it showed), but I'm having camera troubles lately. Mostly that my I take too many, and need to make space. I'm working on it, and hope to start adding photos soon. Really. Oh, and hubby did appreciate the cupcakes for dinner (and the yummy ginger-garlic stirfry I made for dessert). Yesterday I was feeling a little down. I'm not sure why. Maybe it was the rain, and knowing that the temperature was dropping just when I'd gotten used to spring? Whatever the reason, there was just a feel of unease around our house, and I couldn't get my groove. I like to bake when I'm down. I never understood it when my mama would bake cakes to sell all day, and then bake a batch of brownies to relax. I'm still not sure why it works (although brownie batter can cure the sadness anytime), but I know it does. 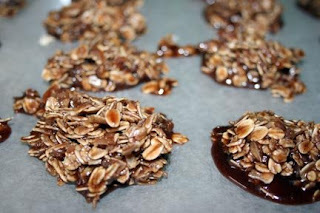 I try not to do it often, because I don't have a huge household of teenage boys to eat the results like I did at home (or a dorm filled with friends who I made them for everyday one semester), but this day I really had the bug to make something chocolately (the hershey's kisses in the pantry just wouldn't do). This cookie, while not baked, has been one of my favorites since I was little. We called them macaroons, and I originally found the recipe in the Sebring, FL community cookbook (my mama's hometown) from the 1950's, but I've seen the recipe in lots of places. It calls for peanut butter, but I find that changes the flavor in ways I'm not looking for. It also calls for nuts, but my hubby doesn't like them so I left them out. 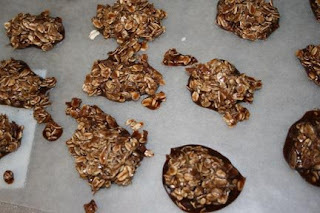 Here is the halved recipe that I used. I realize no one joined me last week, but this is a challenge for me too! I have decided what the prize will be. I found this fabulous head scarf in Weekend Sewing. It's fun to sew, and I think it looks cute when my hair isn't (like today, when it's raining and I don't even bother). Thursday, March 19 - I'm not sure what happened, but my steps got deleted for this day, and my pedometer even stores 7 days of information. My toddler thinks my pedometer is her phone, so I suspect that might have something to do with it. Now, post your results for the week in the comments and I will randomly choose one person to receive the cute head scarf hand sewn by me. If you didn't join me this week, please feel free to start counting today and join me next week. I'm going to keep this up for a while. I'm hesitant to post my weight, but I have noticed that I lost a few pounds this week. I also feel more cheerful and less susceptible to my cravings. Good luck! 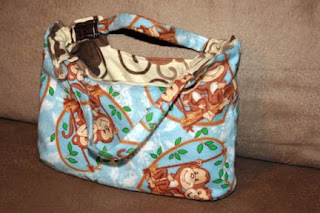 This handbag was a birthday gift for my 3 year old niece (the same one who received the "monkey manket" - her words). I live very far away, so wasn't able to give it to her myself. Her mama tells me that when my brother presented it to her, she looked at him in horror and asked what he'd done to her blanket! They had to show her the blanket and purse side by side. While I'm sorry she got so upset, it makes me feel good that she liked her blanket that much. 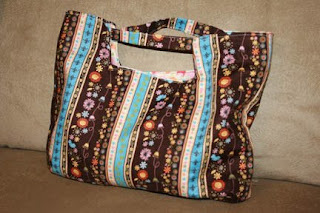 The pattern comes from Bend the Rules Sewing by Amy Karol. The pattern instructions indicate increasing the size of the pattern by 130% (I think), but that it can be made bigger for a tote (more on my tote coming soon). For this project, I traced the pattern at actual size. It's really too small to hold anything substantial, but it's perfect for a toddler. It's also cute for Mama-daughter matching purses (ask me how I know - photos coming soon). I really love the monkey flannel on the inside - yellow with brown monkey outlines. I purchased all the fabric at JoAnns Fabrics and Crafts. I haven't seen this particular pattern again, though. Unfortunately, I realized yesterday that I have been threading my bobbin incorrectly for six months. I discovered this when each time I tried to wind the bobbin, the thread came off in tangles, and if I tried to sew with it (yes, I did), the back side of the piece had tangles of thread. This resulted in me picking out the stitches on the bodice twice. I finally resorted to using another bobbin in a contrasting color that was correct, just to see if it would work. That's how I learned that I'd been reading the directions for the bodice incorrectly, and had sewn the wrong pieces together in the wrong places. Third time to pick out the stitches! All of this occurred on a day that seems to have been challenging for my 2 year old, too. She's very good at amusing herself for short periods, but yesterday was a day of whining, complaining and general dislike of anything mommy presented. For example, she is very fond of her six year old girl cousin, and at times refuses to drink out of anything other than the cup this cousin has used at our house. I thought I'd solved the problem by having my niece drink out of many cups in Abigail's presence, but apparently only the first cup will work. Yesterday, we had quite the battle over which cup she would drink her lemonade from (yes, lemonade). Since I had pink lemonade on hand, it became a battle of whether I was trying to get her to drink strawberry milk instead. Eventually this led to lemonade on the floor. What a day. . . The final catastrophe (after we'd made up and enjoyed our popcorn snack on the porch), was Abigail crashing to our sidewalk on all fours. Usually we just ask her if it was "wee!" and she says yes, and goes on about her business. This time, though, there was a deep cut and lots of blood. Not even the choice of Curious George or Strawberry Shortcake band-aids helped. She actually didn't want band-aids at all. At least they gave her a story to tell her daddy when he came home. Fortunately it didn't include any mean-mommy shading. And we did figure out how to wind the bobbin before bedtime, although the pattern still needs additional study. We found our latest favorite picture book last weekend. Abigail was using up the last bit a of gift card at Borders and fell asleep, leaving her Daddy and I to pick it out. He came up to me, very excited, and presented Click, Clack, Moo: Cows That Type by Doreen Cronin. I was excited that he'd found it on his own, because I had wanted for years to buy it. I used to work at a national chain bookstore planning events (booksignings, children's activities) and doing the marketing and pr for our location. As part of that, I also planned the storytime hour, and sometimes led them. It can be difficult to find books that are able to hold the attention of a group of babies and young toddlers and that can also entertain the parents (enough so they'll want to buy the book). As soon as Click, Clack Moo was released, we started reading it on a regular basis. Click, Clack, Moo is about a group of cows who learn to type and the demands they make of a long-suffering farmer. There are lots of fun noises to make, and the watercolor illustrations won the book the Caldecott award in 2001. The book is recommended for ages 3-7, but the story moves quickly enough for younger children. I found my pedometer on Sunday! It disappeared sometime last fall, and I really missed it. I use it as a watch, and I find that I get a lot more exercise if I'm wearing it. I don't know if it's because I'm paying closer attention (like you tend to eat better if you keep a food journal) or what. I do tend to go on more frequent (and longer) walks when I'm wearing it. My typical day is 2000-3000 unless I purposely go for a walk. I've been thinking that with summer coming, I'd like to be in better shape. I'd like to be able to keep up with my active toddler and set a good example for her. So, I'm starting a 10,000 step challenge. If you'd like to join me, comment on this post. Each week, I will post my step counts for the previous week. You can post your step counts in the comments section of that week's post. Each week, I will choose one person at random from the comments and send you an encouraging prize. I'm not ready to commit on what the prize will be. I'll try it for a few weeks, and see what happens. While the goal is 10,000 steps, I'm nowhere close to that yet myself. So I guess the real goal is to increase your activity level (if you're not reaching 10,000 steps yet). I'll give you my step counts so far this week, but the challenge steps will begin with Wednesday, March 11. For ideas on how to reach 10,000 steps, check out The Walking Site. Comment on this post if you want to join in. Next week, I'll post my results for the week, and you can post your results in the comments. I made this blanket for my 3 year old niece's Christmas present using the pattern in Bend the Rules Sewing by Amy Karol. The pattern calls for two solid yards of complimentary fabric with a yard of flannel for the batting. A suggested variation is to use two yards of complimentary flannel, which is what I did here. My niece loves blankets (mankets), and I thought double flannel would be very cozy. 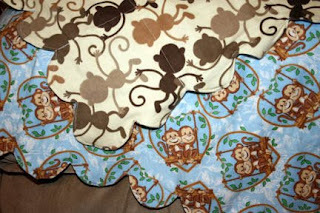 My brother's nickname for her is "monkey" so when I saw these two monkey patterns, I knew exactly what I would make her. I really enjoy this pattern. The scallops aren't easy to do, and I'm still learning about sewing curves. It's really so much easier than trying to crochet a blanket, though! The blanket is less than a yard in the end and is intended as a receiving blanket. I'm considering doing them in different sizes as nap blankets too. I'm not sure how well it would work for swaddling, as I don't have a ready subject at the moment. It works quite well as a nursing cover-up, though (in winter at least).